Michael Jeffrey Jordan (photo ©Steve Lipofsky Basketballphoto.com) was born on February 17, 1963 in Brooklyn, New York. In 1981, Michael Jordan started attending the famous University of North Carolina, where he played alongside teammates who had important NBA careers such as James Worthy. Jordan won the NCAA title in 1982, scoring the winning shot in the tournament final. In 1984, he became the third overall pick in the NBA draft, selected by the Chicago Bulls. In 1984, Michael Jordan won the gold medal as a player of the U.S.A. national team at the Olympic Games in Los Angeles. Since its first NBA season, Michael Jordan rose to prominence thanks to his spectacular game but his team was too weak to obtain great results. During his second season, he suffered a foot injury and skipped most of the regular season. However, during the first round of the playoffs, he managed to score 63 points in Game 2 against the Boston Celtics but lost that game and the others in the series. In subsequent seasons, the results for his team gradually improved and in the 1987/88 season Michael Jordan was elected MVP of the regular season and defensive player of the year. The Chicago Bulls became a team more and more considered among the favorites in the Eastern Conference thanks also to other emerging young players such as Scottie Pippen and Horace Grant but those were the years of the Detroit Pistons, the famous “Bad Boys” who won two consecutive titles. Jordan and his Bulls lost three consecutive playoffs series against them in the 1988, 1989 and 1990 playoffs. In the season 1990/91 there was a further leap in quality for the Chicago Bulls. In the second season for Phil Jackson as their head coach, Michael Jordan was elected MVP of the regular season again, finished by the team with 61 wins, a record for the Bulls. Finally, Jordan and his teammates were able to defeat the Detroit Pistons in the Eastern Conference final and then win their first NBA title with Jordan elected MVP in the NBA Finals too. 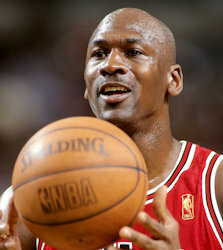 Michael Jordan and his Chicago Bulls won the title again in the two subsequent seasons and Jordan was the first player in NBA history to be elected MVP of the finals for three consecutive years. In 1992, Michael Jordan won the gold medal at the Olympic Games again, this time in Barcelona as part of the Dream Team, the incredible group of champions ho made the history of basketball. In 1993 the controversy about Michael Jordan’s passion for gambling started. His personal situation became particularly delicate when his father was murdered and on October 6, 1993, Jordan announced his retirement from the NBA. Surprisingly, he signed a contract to play with a team of the minor league baseball with the intention to prepare to play for the Chicago White Sox in the MLB. On 18 March 1995, Michael Jordan announced his return to the NBA. Despite his help, the Chicago Bulls were eliminated in the Eastern Conference semifinals by the Orlando Magic. Jordan, however, trained hardly for his future seasons, which saw the second “threepeat” for the Bulls and three other titles as the MVP of the NBA Finals for him. Phil Jackson’s contract was due to expire, Scottie Pippen and Dennis Rodman, another star in the latest titles, wanted to leave and the dispute between players and owners led to the NBA lockout. Michael Jordan announced his second retirement as a player but remained in the NBA as an executive of the Washington Wizards. On 25 September 2001, Michael Jordan announced his second come back as a player, but this time for the Washington Wizards. However, the team wasn’t comparable to the Chicago Bulls and Jordan also had some physical problems so he didn’t even reach the playoffs in his last two seasons as a player. In 2003, Michael Jordan resumed his role as an executive of the Washington Wizards but the franchise owner Abe Pollin fired him almost immediately believing that his contribution had been overall negative. Michael Jordan has been one of the sports personalities that have aroused the greatest interest from the media and has contributed to the growth of the NBA. Also for this reason, he’s considered by a lot of people the greatest basketball player of all time. It’s always difficult to compare different players, especially from different ages, but nobody can deny that Jordan is at the very least one of the greatest of all time. With his greatness he’s become a personality very well known beyond basketball and sports.